Uprising of the Yaqui Indians – Yaqui Warriors in Retreat, by Frederic Remington, 1896. In August 1860, bands of Yaqui and Mayo insurgents, some 1,000 or 1,200 strong, marched towards Guaymas, burning and leveling Mexican settlements as they advanced. The citizens of Guaymas fortified the town, declaring a state of siege, and armed 350 men in its defense. The Prefect of Guaymas dispatched a courier to the Governor at Hermosillo, demanding additional aid. The dispatch reached Hermosillo on the 31st of August. Governor Pesquiera, with a force of sixty horse and eighty infantry, promptly left Hermosillo. He intended to travel to El Cachora to gather an additional 300 troops, but the Yaqui ambushed him and his troops en route at Jacalitos, a small village about forty-two miles from Hermosillo. Agustin Ortiz, whose brother Carlos was then the governor of Sonora, led an attack from Navojoa to Capetemaya in 1882, with the intention of capturing Cajemé. Cajemé was wounded in the Battle of Capetemaya, but the forces of Ortiz were routed. Fighting in the Mayo territories continued until 1884 when they agreed submitted to Mexican authority. However, Cajemé continued to insist on his independence. In May, 1886, the Mexican army began a concentrated series of military campaigns against the main Yaqui fortress of El Añil. General Carrillo, with 1,200 soldiers, initially attacked El Añil in a fierce battle to dislodge the indigenous Yaqui forces. General Ángel Martínez brought up an additional 1,500 Mexican soldiers, and concentrated his forces to finish the campaign with a decisive blow. El Añil was captured on May 12, 1886. Only a few Yaqui soldiers escaped by fleeing deep into the mountains, leaving 200 dead, and some 2,000 people, consisting primarily of the elderly, children, and the sick. The losses of the Mexican forces were 10 officers and 59 troops. Following the battle, the people living in the villages of Huiviris, Potam, Bacum, Cócorit were amnestied by the Mexican government, in return for giving up their weapons. In return, the people in the villages were given clothes and food. The bulk of the remaining Yaqui soldiers were now unable to make war directly on Mexican military forces, so hid in the mountains, while being persecuted and systematically decimated. At this point, Cajemé sent a note to General Juan Hernández saying"
"Desde luego nos someteremos todos a la obediencia del gobierno, bajo la condición de que dentro de 15 días se retiren todas sus fuerzas que están en el río Yaqui para Guaymas y Hermosillo, de no hacerlo así, pueden ustedes obrar de manera que les convenga; yo, en unión de mi nación, estoy dispuesto a hacer hasta la última defensa." "We will all submit in obedience to government, under the condition that within 15 days [the government will] withdraw all their forces at the Rio Yaqui to Guaymas and Hermosillo. Failing to do so, you can act in a way that suits them [the government]. I, together with my nation, am willing to continue [fighting] until the last defense." Nearly one year later, Cajemé was captured in the village of San José de Guaymas, about 10 miles outside of the Port of Guaymas. Cajemé was eventually transported to the mouth of the Yaqui River, and paraded through many of the Yaqui villages to show that he had been captured. On April 23, 1887, Cajemé was executed at Tres Cruces de Chumampaco. Juan Maldonado took Cajemé's place, and continued a guerrilla war in the Sierra del Bacatete. The Yaqui towns along the Rio Yaqui became mostly deserted, with many of the inhabitants fleeing into the surrounding mountains, and to other states in Mexico, including Chihuahua and Sinaloa. In February 1896 an event known as the Yaqui Uprising began after the Mexican revolutionary Lauro Aguirre drafted a plan to overthrow the government of Porfirio Díaz. 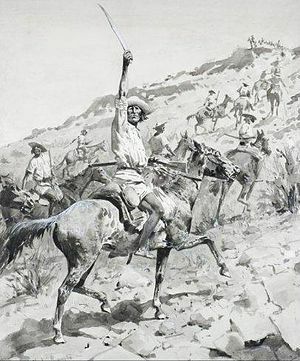 Aguirre and his men were able to convince several Yaqui and Pima natives to join in the revolt so on August 12 a combined force of no less than seventy men attacked the customs house at Nogales, Sonora. A battle then ensued which left at least three people dead and many more wounded. 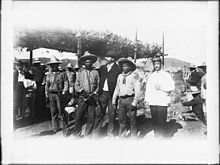 During the fight a group of American militia formed in the adjoining town of Nogales, Arizona and they assisted the Mexican defenders in repelling the rebels' attack. Ultimately the Yaquis and the others were obliged to withdraw from the area, ending the uprising and leading to a United States Army operation to track the hostiles. Two companies of the 24th Infantry Regiment were assigned to hunt the rebels who were being pursued by troops of the Mexican Army Colonel Emilio Kosterlitsky. However, the rebels got away, some escaped to Arizona. In 1897 a peace treaty was signed in Ortiz between the Yaquis and the Mexican government but in 1899 another serious outbreak of hostilities began and it led to the bloody Mazocoba Massacre of 1900, in which several hundred natives were killed. Manuel Balbás wrote in Recuerdos del Yaqui how some Yaqui's at Mazocoba survived combat, but chose to take their own life, either with their own weapons, or by throwing themselves from the cliffs rather than surrender to the enemy. One event in which a young woman who had been hiding but was discovered, without a tear in her eyes, "approached the body of her loved one, knelt a moment, bowed slightly, and perhaps for a last time looked at the face of the beloved, and arose at once, quickly running like a gazelle toward the precipice, and without a moment's hesitation , plunged into the abyss." It was at this point in time, in the late 1890s and early years of the 1900s, that a large number of Yaqui people began traveling north to settle in the United States around Tucson and Phoenix, Arizona, and into parts of Texas, including the El Paso area, as well as the Lubbock area, where a group of Yaqui refugees had settled years earlier. a group of Yaqui Indians at the surrender and signing of peace treaty at Ortiz, Mexico, ca.1910. Two Mexicans stand near three Indians in the foreground. The Yaqui warrior Cajemé in April 1887, taken at the time of his arrest by Mexican authorities. Cajemé under arrest at Guaymas in April 1887. The Yaqui leader Anastacio Cuca in May 1887. Tres Cruces de Chumampaco in 1895, where Cajemé was killed. General Álvaro Obregón and his staff of Yaquis, sometime between 1910 and 1915. ^ Meredith, John D. (1975). "The Yaqui Rebellion of 1740: A Jesuit Account and Its Implications". Ethnohistory. 22 (3): 222–261. doi: 10.2307/481032. JSTOR 481032. ^ "From Sonora: The Correspondent of the Bulietin [Official State newspaper of Sonora]". Sacramento Daily Union, Volume 20, Number 2974. 8 October 1860. Retrieved February 3, 2014. ^ Rummel, Rudolph. "Mexican Democide Line 57". Hawaii.edu Power Kills. ^ "Mexico Troops Capture 415 in War on Yaquis". Los Angeles Times. Los Angeles, California. April 28, 1927. p. A-1. ^ "Surrender Due in Yaqui Strife: Leader Expected to Accept Mexican Terms Today," Los Angeles Times, October 2, 1927. ^ "Yaqui War Near End: Final Chapter of Century of Strife May be Written with Chief's Surrender". Lawrence Daily Journal-World. September 30, 1927. Retrieved 2013-08-01. Garcia, Mario T. (1981). Desert Immigrants: The Mexicans of El Paso, 1880–1920. Yale University Press. ISBN 978-0-300-02520-0. Garza, Hedda (1994). Latinas: Hispanic women in the United States. University of New Mexico Press. ISBN 978-0-8263-2360-6. Ruiz, Vicki; Virginia Sánchez Korrol (2005). Latina legacies: identity, biography, and community. Oxford University Press. ISBN 978-0-19-515399-6. Troncoso, Francisco P. (1905). Las guerras con las Tribus Yaqui y Mayo del estado de Sonora, Mexico. Mexico: Tipografia del departamento de estado mayor.